Stunning Amatrice was listed as one of Italy’s most beautiful historic hillside towns with good reason and unlike some of its neighbouring Apennine towns, whose entire populations wintered and worked on the coast or Rome it remained alive in the winter. We’ve made a few food pilgrimages via the short trip up and across Lago Campotosto to the town over the past 12 years. Tears that prick your eyes for the victims of an un-just earthquake are always harder when you’ve visited their hometown or village. Happy day-trip memories are stabbed by long pointy needles that pierce with their flickering images of anguish and the unbelievable cruel devastation that sees hope ripped from even the strongest communities. The town’s divine spaghetti all’amatriciana is world famous and it cheekily endows English-language speakers with a seemingly unpronounceable word, guanciale – pronounced gwan-char-lay. Watch the face of a local butcher here as he hands you a thin slice of this aromatic cured pig cheek, the equivalent of his best champagne whose flavoursome fat tastes of rich prosciutto. He will check that you really, really do appreciate its qualities. Never ever say it’s like bacon or pancetta for fear of forever being labelled a philistine to his other customers! It’s the same when you make an amatriciana sauce; no bacon, no garlic and no onions if you want to be properly authentic. I make spaghetti or bucatini all’amatriciana about twice a year as it’s rare that I run into guanciale in the UK but just occasionally it will show up in a local food market or at my local Italian deli. I’m going to pledge to match the cost of the bottle of wine I serve alongside my Amatriciana and €2 per member of the family that eats in an ongoing twice-annual donation. It would be wonderful if making it could always be at the time of Amatrice’s sagra, the last weekend in August which will be held as a #virtualsagra this year as created by Mike Madaio and no doubt for the foreseeable future, just to show these communities they aren’t forgotten. We may not always have the right words to convey our emotions, especially in another language, but, hopefully, their special dish like all amazing food will act as the all-important bridge. Jamie Oliver reiterated that a long-haul fundraising campaign is required for those affected by the Amatrice earthquake, his restaurants’ donation mirroring the campaign led by food blogger Paolo Campana, and adopted by Slow Food and restaurants in the US. 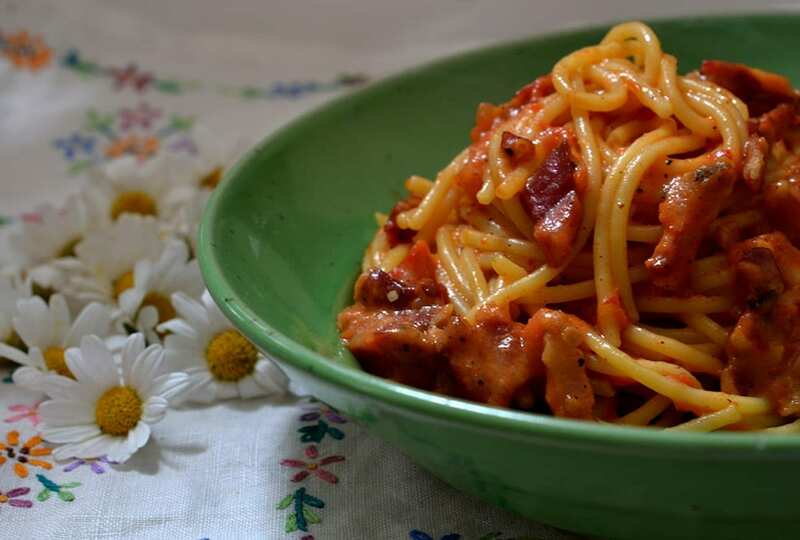 Each restaurant will donate 2 €$£ for each order of spaghetti all’amatriciana so do check which of your local Italian restaurants is part of this campaign. This campaign needs to last for a minimum of 2 decades and provide a steady drip-feed to charities that are able to help repair and rebuild lives on the fast track. The Red Cross & Save the Children are the most valuable independent charities anyone can donate to in the current emergency phase. This will change over time and I will update this page and list charities as it changes. Although our village lost its church in the previous L’Aquila earthquake, unlike Amatrice and its surrounding villages, its houses remained standing even if some were uninhabitable. Despite the earthquake happening some 7 years ago, it was the summer of 2016 that saw our adopted little village and house in Abruzzo encased in scaffolding with work beginning. The answer of why it had taken 7 years to commence work after the 2009 earthquake remains unanswered beyond ‘bureaucracy’. The old ladies have been moved into nearby houses, lamenting that they want to die in their own house, which makes me wonder do they know something I don’t about the promised completion date of June 2017?! I feel fortunate that our comune is one of the few to take up the battle to access state funds that not just restore but pro-actively test and reinforce communal houses with adjoining walls. It by no means offers an assured guarantee that your house will still be standing at the time of a strong and shallow earthquake, but it will help along the lines of ‘stronger together’. The grant covers tidying up after builders, geometras and architects who have historically been paid for anti-seismic measures by their clients but whose work falls short of changeable legal requirements, something we found out all too directly with an aspect of our own house this summer. Despite rage and annoyance with the ‘approved’ and ‘recommended’ person in our case and the inconvenience of the house being out of action, thank goodness the comune is making it as safe as it can possibly be to withstand an earthquake, although it is crazy that a state whose economy is faltering is forced to pick up the bill for shoddy workmanship that leaves people vulnerable. If anything good can come from yet after another huge loss of life from an earthquake it will be that Italy makes the take-up of these funds mandatory by local comunes. By proactively protecting the people of some of Italy’s most beautiful, but seismically ‘at risk’ historic villages and towns, a compassionate and democratic government is undertaking its main duty, care of its population, upkeep of their cultural heritage and protection where possible of their livelihoods. Italy needs to show the world it is catching up with other equally at risk nations like Japan or the state of California. 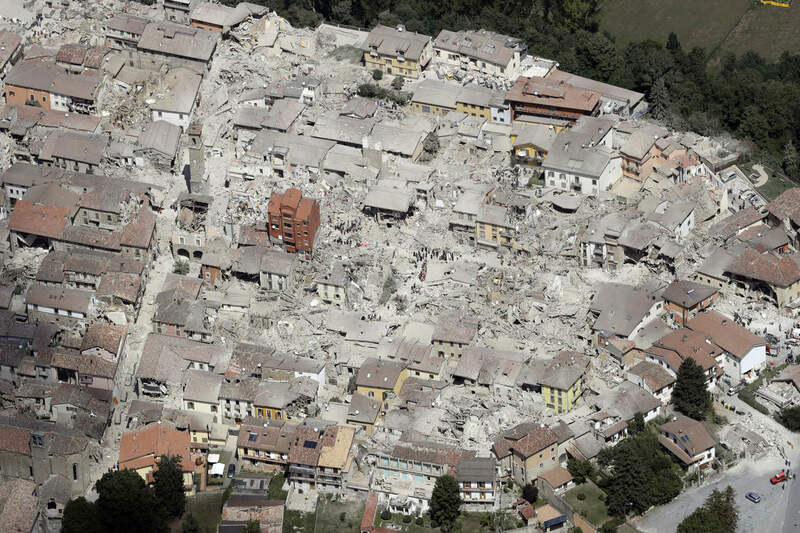 If such measures had been put in place after the L’Aquila earthquake would a state of emergency have been declared yet again in the towns and villages within the Abruzzo provinces of Northern Teramo and L’Aquila after the most recent Amatrice earthquake? Appointing independent architects and geometras with no local ties to supervise, over-rule and sign off all new construction and restoration should be the government’s immediate measure in the long-term protection of lives in Italy’s seismic areas. It may just reduce the impact of cronyism on what is a matter of life and death. Scald the tomatoes in boiling water and then peel, removing the central part and the seeds. Cut the tomato into pieces and place them into a bowl with their juice. Grate the pecorino, make sure you do not use Pecorino Romano as its flavour is too strong and it's too salty. In a frying pan add a tablespoon of lard and let it warm on a high heat so that it completely covers the bottom of the pan. Add the red chili pepper and the strips of guanciale turning them immediately with a wooden spoon. . Reduce the heat and fry the guanciale for a few minutes, until it has reached a light golden yellow colour. Stop the frying and pour the prepared tomato into the frying pan. Cook the sauce for about 10 minutes, turning occasionally, until it reaches the right degree of density and fluidity. When it is cooked, remove the red chili and drain the cooked spaghetti. Put the spaghetti into the fryingpan and saute it, adding the grated pecorino, a little at time. Pour the spaghetti in a dish, garnish it with some more pecorino and serve hot. You have tackled the personal, emotional and practical here. That takes guts. A new campaign to ask the right questions should be forthcoming from locals. Ah thank you! Something has to change that is for sure!